Facts you probably don’t know about SSC Preventive officer. Under this article, Aspirants are told about the factors that motivates for the SSC- Preventive officer. Preventive officer posts are considered to be one of the most deviated posts. 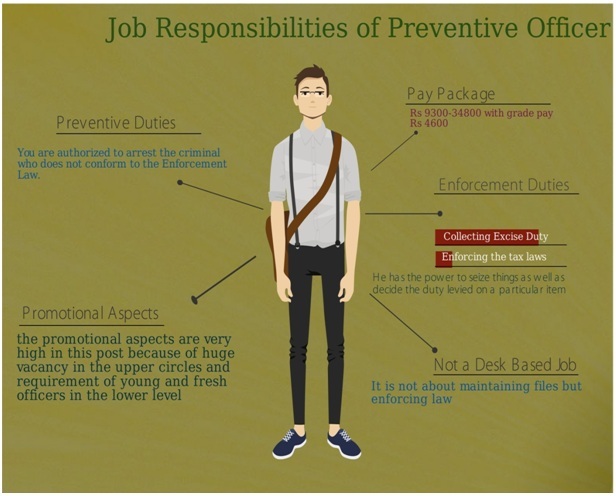 So, this article gives you a glimpse about what opportunities Preventive Officer is offering. Preventive Officer: Why is it popular? Not a desk based job: For aspirants who want a job in the government, yet do not want a boring desk based job, this is the best option since it is not about maintaining files but enforcing law. Preventive Duties: You have the power to arrest somebody and enforce the law of the land on the arrested. That makes you a feared person among the citizens. You earn better respect and status in the society because of this capacity of yours. Preventive Officer is a job that will give you thrill and adventure despite being a government job. You can show your power, can be fearsome, that is the best thing about it. Other than this, you have very good promotional avenues attached to this post. So, get ready to take the challenge as SSC CGL is coming up.